Every ounce of searing emotion that Verdi lavished on his opera about love, betrayal, and its bitter consequences is brilliantly realized by James Levine’s passionate conducting and his stellar cast. 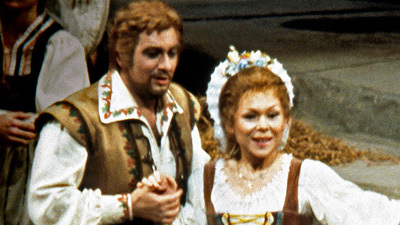 Plácido Domingo is at his most golden and ardent as Rodolfo, the son of Count Walter (Bonaldo Giaiotti), in love with the poor Luisa Miller (Renata Scotto). The count’s henchman, Wurm (James Morris), blackmails and lies to prevent the marriage, but even Luisa’s beloved father (Sherrill Milnes in a stunning performance) can’t prevent the ultimate tragedy.